Sweet and nutritious Yojo to restore your mojo! Many thanks to my friend Julie for giving me this recipe. Sweet and nutritious Yojo to restore your mojo! Many thanks to my friend Julie for giving me this recipe. Mix the sugar-free Jello envelope with the 1 cup boiling water until dissolved. 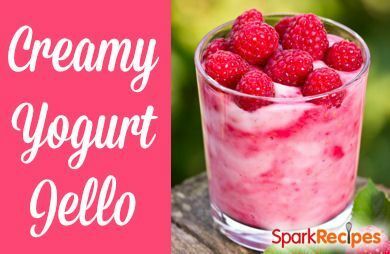 Stir the jello/water mixture into the 1 cup yogurt until well mixed, being sure to do this very slowly so as not to curdle the yogurt. Divide into 4 half-cup servings (the little gladware containers are great for this!) and refrigerate until set, between 2 and 3 hours.